In today’s Europe, students face conditions that are everything else but glamorous. Budgets for higher education have been slashed in almost every country. Rising tuition fees and cuts to student grants have also made students suffer. Students have troubles with financing their studies and their living standards are deteriorating. The pressure to study fast and “fit in” to the system leaves a strong mark on a young person pursuing education. An apparent and xenophobic atmosphere has also gone viral in Europe and impacted the treatment of minorities. The European Students’ Union has warned about this negative social phenomenon and urged students to fight the rise of neo-fascism. Ideology that is close to extreme right forces may seem as a simple solution to an economic instability. But today, the need to restore a humble attitude, intercultural respect and fair treatment is as strong as ever. For these reasons, it has become essential to bring the voters’ attention to the voice of students for our future to be safe in the hands of decision makers. It is time for the citizens of Europe to take action and ensure that students will be heard. Young people must realize that their future is their own responsibility. By leading students to vote, we can make a difference and tilt the course of Europe in the right direction. Many young people feel that the EU is too distant to their daily reality and don’t see what decisions can affect them and in what way. They do not know how important it is to take a stand and the value of speaking up for their rights or demands. This is fully understandable, because the EU is indeed still too far away from us. Many decisions are made behind closed doors and stakeholders are often not listened to or heard in those processes. Young people demand that the EU will become more open and transparent. Trust in the EU must be restored and it brought closer to its citizens. The impact of policies and the reasoning for why certain measures are taken must be clear to all people that will ultimately be affected. The European Parliament must take a position as a credible institution with accountable and responsible members, instead of a training ground for national parliaments. That would be a responsible step towards creating a common future for all Europeans. 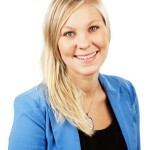 Elin is Member of the Executive Committee of the European Students’ Union and represents the interests of university students on European level.